“I’m blue in the face from using the word “lucky” to describe my experience of studying at the University of Richmond (UR), Virginia in the USA over the last four years. I don’t think any word is more fitting really. Dad always tells me that you “make your own luck in this world”, and I do believe that, but I also believe that if you make a decision like moving continent when you’re 18 years old to a place you’ve never been, to be part of a team of people whom you’ve never met and study in a third-level system that is totally different to anything you’re used to, there needs to be someone looking down on you! I vividly remember sitting in the living room in my house in Ballybricken, Limerick on a Friday evening with my parents the first weekend in April, 2010. I got a text from a former teammate of mine, current UCD captain and Irish senior international, Deirdre Duke, telling me that this man by the name of Ryan Elliott was in contact with her about the possibility of her studying at UR in the USA. She told me that it wasn’t for her at that time but wanted to know if I minded if she gave him my name. Sure, I thought, why not? Within the hour, I received an email from Ryan. I read it once, and twice, and three and four times before showing it to my parents who were instantly supportive. At that time, I had already applied through the Central Applications Office (CAO) to do Physical Education Teaching at the University of Limerick the following September pending my Leaving Certificate (*LC – A Level equivalent) results that August. That evening was the start of a long email thread between Ryan and I full of both questions from me and information from him but I was fully focused on doing well enough in the LC that June. After getting the opinions of those closest to me, having sat the SAT (test used for college admissions in the USA) on stand-by in Waterford, having weighed up all the pros and cons I could possibly think of, I emailed Ryan the first weekend in the middle of the LC telling him that I was committing. To clarify the timeline of events, I first heard from Ryan in April, I sat the SAT exams in May and in the first weekend in June I committed. When I tell my American friends of how I ended up in the States, they are generally very shocked by this timeline. Most of my former teammates would have been in contact with the coaches on the team and the University by the age of 16 at the latest, and would have visited the University on multiple occasions before making their decision. It wouldn’t be right if I didn’t thank my Mom, Lucy, for ensuring the mounds of paperwork that go along with the enrollment process for being an international student-athlete in the USA was completed during a time where I was too busy studying to be doing any of it. So thanks, Luce! My favourite time at UR was last November over a ten day period when we had senior day (a celebration of the seniors on the team at the last official home match of the season) and then the conference tournament which happened to be on the campus of UR for the first time in my four years. My parents and younger brother, Matthew, both flew over for this time. We managed to win our conference against our rivals and team that had beaten us in the conference final the two previous years, University of Massachusetts (UMass), in sudden death extra time. A moment I won’t be forgetting is jogging across the pitch after the match with the team to my open-armed, teary eyed 19 year old brother who just couldn’t hold back his own excitement. My family did the best they could to get across to visit me throughout the four years I spent there, and it was definitely hard after some matches seeing my teammates surrounded by their friends and family who travelled to see them knowing that I had no one waiting for me, but having most of my family there for this day overshadows all of those less enjoyable post match moments. With that being said, the generosity I received from the families of my former teammates at UR is immeasurable. They opened their arms, their homes and their fridges to me on a consistent basis! Collegiate sport in the USA is different from anything I had experienced previously. Firstly, your coach is a figure of authority which I learned very quickly upon arrival. At Richmond we called the head coach, “Coach”, and never by her first name. That’s not to say that I didn’t have a certain level of respect for the coaches I had in Ireland, but the level of authority coaches have in the USA seemed to be greater from my experience. Secondly, the resources available to student-athletes was unparalleled. We had academic advisors who would ensure we were taking the right classes and doing well in those classes, we had access to athletic trainers (or physios, as they’re known in Ireland/UK) on a daily basis, we had a strength trainer for our team, we had a water-based pitch on the campus and we had our own locker room with a flat-screen TV, showers and couches. 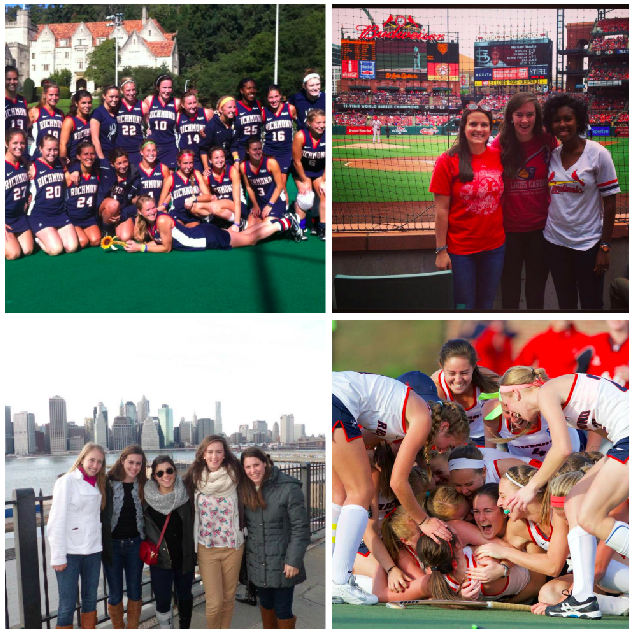 These are just a few of the perks of being a student-athlete in the USA. Money and looking for funding for sport was something I never once worried about during my time there. My hope is that the sport of hockey reaches a level in Ireland where provincial, but especially, international athletes of all ages don’t have to worry about paying a certain fee to represent any team. All in all, the American collegiate experience was one that taught me the importance of family, that when an opportunity presents itself you should grasp hold of it with both hands, that adversity teaches you an awful lot about yourself, and that the people you surround yourself with will determine your experience of something. I try not to have regrets, but there is definitely one thing I would do differently. Back in 2011 when Ryan and I were in almost daily contact about this UR adventure, I told myself that if I went, it would just be for the year and that I would come home and resume my Irish life then! I went over there with an open mind but in the back of my head, I was convinced that I would come home that May for good. With that in mind, I don’t think I allowed myself settle as much as I could. The girls on the UR team still joke about how they never really knew me my freshman year. I can only credit this to the mentality centered around the idea that I was coming home so I didn’t want to fully be myself. In hindsight, I wish I jumped in head first. On the flipside of this, I am the type of person to tread carefully until I find my footing. So I think doing this allowed me to eventually create a life for myself over there and ultimately lead me to be one melancholic girl when it came time to say bye for now last August. Here’s some advice to get the ball rolling. If you have a university in mind you should check out their website and contact them directly. Another way of linking with Universities in the USA would be to talk to the national organisation for your sport who might have links or contacts for you. Also the NCAA website is a good source of information. It is never too late and it is never too early to give it a go. Pick up the phone, write the email and send us some photos when you get there!